As I’ve been working on the accessories for my girl’s room, more and more I love the fabrics that I chose for it. 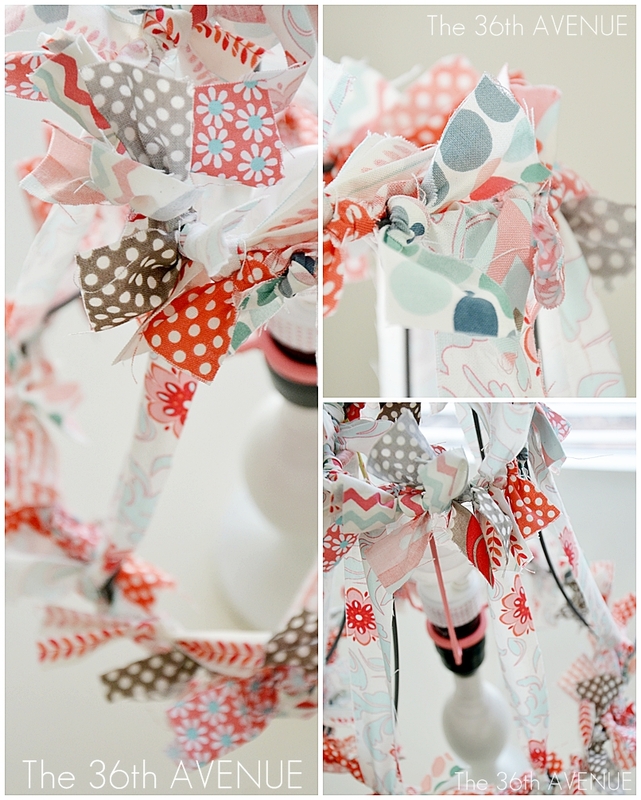 My scrap lampshade is the first project that I am showing you with those super cute fabrics!! I am in love with this lamp… it makes me happy! Most of the fabrics came from the fabulous Verona Collection by Riley Blake Designs. These fabrics were the inspiration for the entire space. I wanted to add some more patterns with a modern twist. These other fabrics from the Hullabaloo Collection by Urban Chiks for Moda were perfect! These last two by Michael Miller had the beautiful coral tones that add brightness to the space. By the way white daisies are my favorite flowers! I purchased all of my fabrics over at one of my local fabric stores. 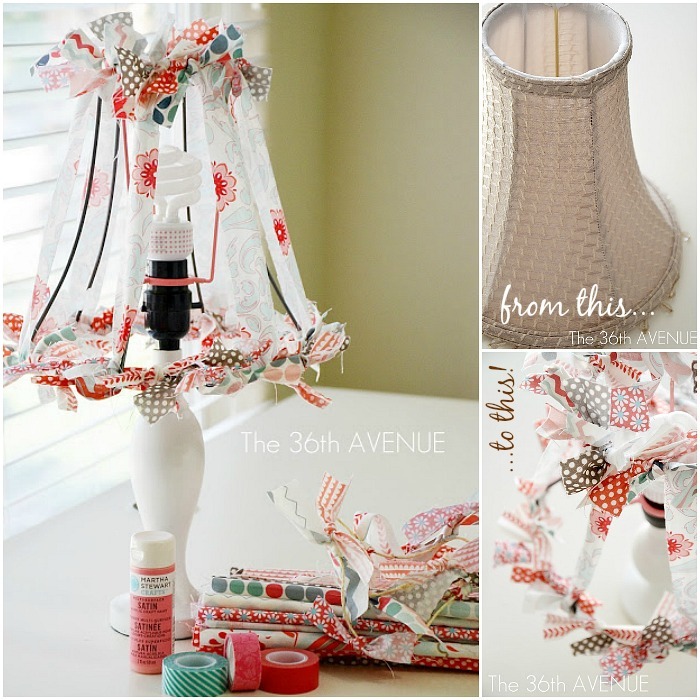 OK… back to the Fabric Scraps Lampshade! Let’s share a tutorial… shall we? I used fabric, Washi tape, paint and of course a brush and scissors. The first thing you’ll need is a lampshade. The point of a project like this is to be thrifty… an old shade would be perfect. I bought mine back when we were living in Oregon, for $1 at our local Thrift Store. Please, promise me that you won’t cut your precious hands. I used an exacto knife to help me remove the original fabric. You want to take all the fabric out! delicious Flamingo Pink by Martha Stewart. I love this color and the paint quality is excellent! After the paint dried it was time to have fun! I cut strips of fabric of about 1.5 x 4.5 inches and I tied them around the top ring of the lampshade. Play with the fabric so the pretty side of it faces you. The vertical strips of fabric are going to be longer. The length will depend on the size of your lampshade. and then flip the strip of fabric over. Do the same at the bottom. Repeat the process on top of each vertical piece of metal. By the end your shade will look like this! If you are new here you should know I’m a freak! I used some Washi Tape to spice up the light bulb. So there you have it… Make a bunch of knots. …and create something that lights up your own world. the weekend is almost here… let’s enjoy it! I hope you stay in touch with me and Subscribe to The 36th Avenue via Readers. Tanya, I want you to know that you are appreciated as well… your comment made my day. Thank you so much for visiting with me… Have a wonderful week my love! Just discovered your blog via Postively Splendid. This is a great tutorial. I’m working on one using burlap for a friend; but your post has given me even more ideas for it. Thank you for sharing. I’m going to take a cruise around your previous posts now and I’ll definitely be back for more! Great blog! That is sooo adorable! I’ve made some lampshade “skeleton” cloches before, so we’re on the same wavelength! That looks GORGEOUS! We would love for you to come share it at our weekly link party and enter to win a $50 gift card to Mikarose Clothing! Thank you ladies for the invite… Have a great week! Oh wow! That is so cool! Different, eye-catching and beautiful! Emily I will add your name and link to your site on my post. I am wondering if Emily Taylor Design and Riley Blake Designs is the same thing. Should I put by Emily Taylor for Riley Blake Designs? Let me know… I LOVE your fabrics!